As the World Cup rages on there are a number of big questions swirling around the heads of those observing. "Who's gonna win this game?" "Who's gonna win that game?" "Why do we let America participate at all when they can't even get the name of the game right?" — you know the drill. One of the smaller — but nonethless intriguing — questions at play, though, has to do with American player Tim Howard's facial hair. For example: How did he settle on that particular shape? What is his grooming regimen? And what does Tim Howard look like without that beard? 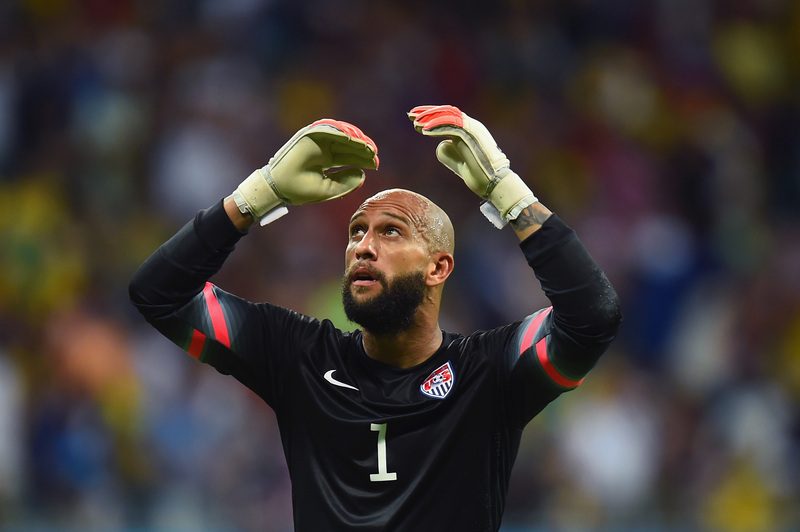 As a Daily Beast headline declared recently, "Team USA Lost, But Tim Howard Is A Winner." They assert that Howard was integral in carrying America through their time at the World Cup — and part of the reason Americans seem to be caring about soccer at the moment. And though his hair was not as Illuminati-tastic as, say, Cristiano Ronaldo's, his facial hair still made a visual mark. In other words, expect at least one soccer bro to be rocking a felt version of it come Halloween.